Open during the entire year, on-campus housing is available in Duquesne's five residence halls to all accepted international students, except for students requiring family housing. Read about the cost of housing. 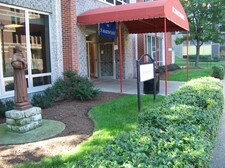 Along with the University's services to students, like the health service, counseling services and help for students with disabilities, International students get help from ELS and Internaitonal Programs to help them adjust to university life, language, culture, and society in the U.S.
Small classes with dedicated ESL faculty members. ESL tutors available for extra help with class assignments. Conversation partners are available for extra practice through ESL and the university. Click here for more information on student tutoring services. Academic advisors assigned to each student. Learning technology access that is program-based, including a state-of-the-art mobile wireless laboratory and self-access computer center. Field study trips to city and regional locations organized by the Office of International Programs and the ESL Program. Visits to U.S. host families offered by Global Pittsburgh. University student organizations related to career development, sports and recreational activities. International Student Organization (ISO) participation available. Conversation Hours to practice English and meet U.S. students.